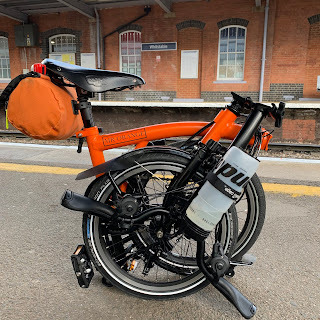 My Orange Brompton: Winter is here! This morning I was due to go to work in my car as I had quite a few bits and pieces to carry and didn't think I'd fit them all in my O bag. One look out of the front door and I saw lots of ice on the windows of my car that made me change my mind. I packed the O bag with as much as I dared and then resorted to borrowing my Ortlieb backpack (which used to be mine but now my one of my daughters) and putting the remainder of in that. This all worked pretty well and I was able to carry all I had intended with little fuss. I set off quite early and it was freezing cold. My commute was slower than usual not because of the heavier load but because of icy patches that were just about visible. Heading for home it was if anything even colder and I was glad of the merino base layer I packed just in case for the journey home. Winter is very much here - at least for the moment - and the forecast looks set to bring colder weather. As I type this I had to think back to this morning when I made the decision to take the Brompton rather than the car. The prospect of scraping ice off windows would have taken a great deal longer than just unfolding and going. In addition to this once I reached work and home a hot mug of tea made cycling on a cold winters day that bit more enjoyable. Winter may well be here but unless there is heavy snow, it won't stop this rider from getting his daily Brompton fix! That's the spirit, Mr. O!. I find cycling always relaxing. If the conditions are so horrible that I can't cycle, often times, where I live I can't drive either. So, it works out just fine, ya know?